Activator is a Cydia tool that enables programs and plugins to be launched without tapping on an icon in the SpringBoard. By default Activator can be launched through touch gestures, button presses, and accelerometer-based motion controls. The default actions these gestures can be assigned to include launching applications, navigating through settings, taking control of music playback, and switching toggles. Activator is powerful, often underused, and can be enhanced greatly by other plugins on Cydia. Unfortunately there isn’t a category in Cydia for Activator plugins or extensions, so here’s a list of the top 5 extensions that we use at iJailbreak. While launching toggles and programs through TerminalActivator in a local terminal window is a waste, TerminalActivator really gets cooking when activated over a network through SSH. You might recognize TerminalActivator; it was featured on our list of Top 5 Utilities For Remote Access. With OpenSSH and TerminalActivator installed, all you need to do is login to your device through SSH–typically “ssh mobile@IPAddressHere”, default password’s “alpine”–and can call up your preset “notify_post” activator commands without having your iPhone, iPad, or iPod Touch nearby. BeeKeyboard‘s Activator menu allows for custom key combinations. BeeKeyboard isn’t the only utility that allows keyboard button presses to stand in for Activator gestures, but it’s currently the most powerful method–allowing for custom key combinations, like pressing shift+control+F to launch a Spotlight search. In addition, BeeKeyboard includes many other useful plugins aside from Activator–not limited to shortcuts, keyboard navigation, and a virtual iCade gamepad. The closest comparable plugin is BTStack Keyboard, which is older, has fewer options, and requires using BTStack instead of iOS’ default Bluetooth stack. 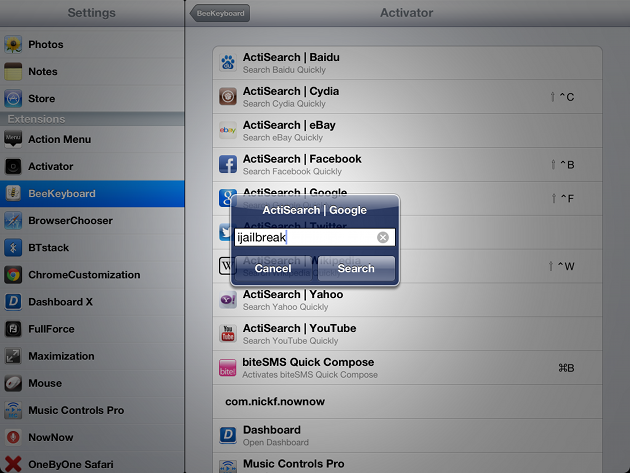 ActiSearch isn’t a single Activator plugin; instead the package contains plugins for eight separate search engines including Google, Facebook, Twitter, Wikipedia, and Cydia. 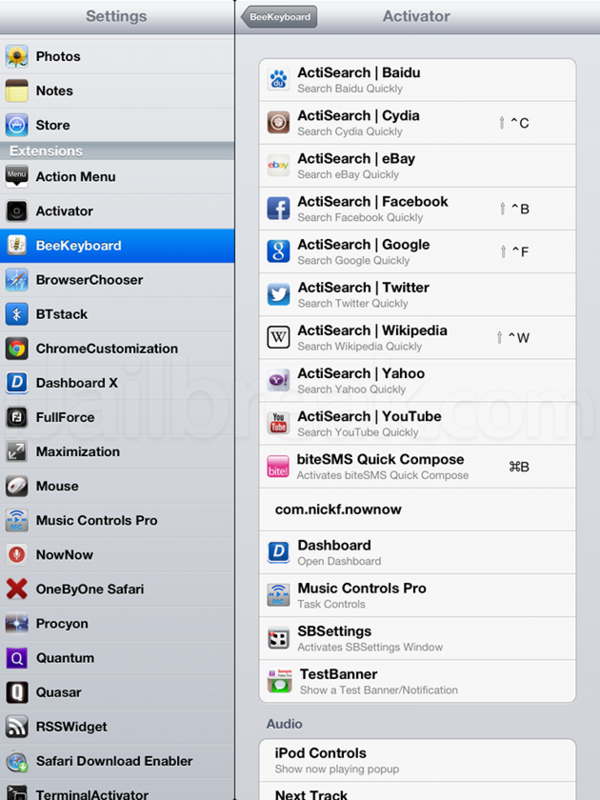 The search dialog’s even keyboard compatible, so if you use BTStack Keyboard, BeeKeyboard, or followed our list of 5 powerful tweaks for making the iPad feel like a fully featured computer, Actisearch provides instant access to web searches. For those of us who are jailbreaking, Siri’s only officially available on the iPhone 4S. You could try your luck with a Siri port–like Spire and Spite–but those tend to be unreliable, and we don’t always trust third party proxy servers. NowNow brings instant access to safe voice searches through Google. It’s not as comprehensive as siri, but for quick searches it’s a neat trick. You can even ask it to launch youtube videos. Not happy with BiteSMS’ default volume button + HUD tap gesture? If you go into BiteSMS’ Settings Quick Compose -> Use Activator, you can use Activator to pull up BiteSMS’ quick compose overlay instead. 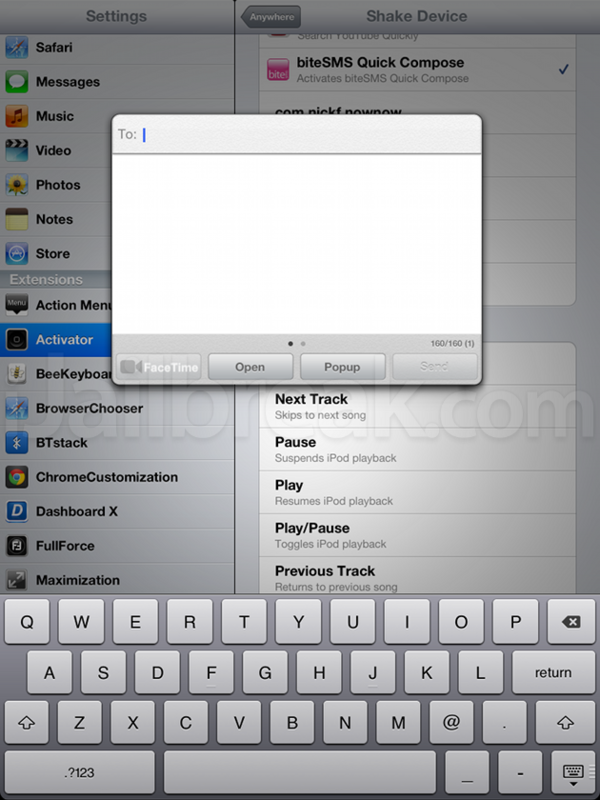 The activator plugin is a handy addition, and we can confirm that it can work purely through keyboard input. While this is a best-of list of Activator plugins, it doesn’t cover every worthwhile Activator add-on. What’s your favorite activator plugin or extension that’s not on your list? Share your thoughts in the comments section below.